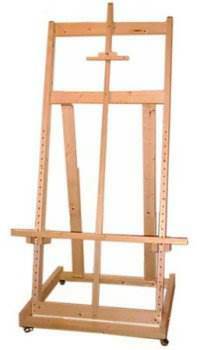 An artist's easel can be as simple as three legs and a cross member, or a large studio easel, made to hold large, heavy canvases. Whether you choose a simple, foldable tri-leg stand or a massive studio piece, you can save money and build an easel that is sized to fit your needs with free artist easel plans. Simple folding tripods can be made in a few hours, while a major studio easel can take a weekend. Use clear pine or hardwood and stain or seal with urethane. Make a child's size easel or double sided drawing board for the playroom. 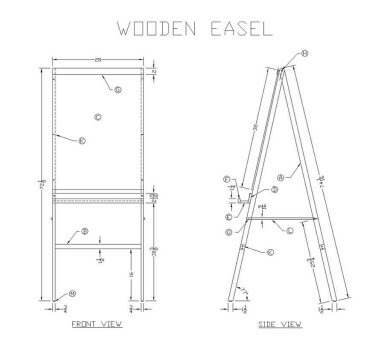 These easel plans are easy to customize to fit the room and the size of the artwork. Many of these designs are foldable and portable, so storage is no problem. The accompanying plans, tips and material lists make this a perfect project for beginning woodworkers. Here is an artist's easel built out of cherry and therefore ages beautifully. Create one using these instructions. 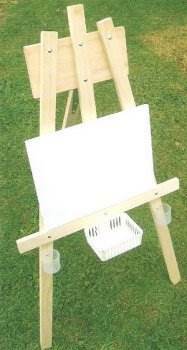 Build an artist easel that holds canvas for painting, displays art and is built to be easily folded up and stored away. Here are instructions for building a studio easel that can hold a very large canvas and costs little to make. Here is a project for a wooden easel that has a dry erase board and it can also display your favorite paintings and posters. Make an easy to build kid's easel that has lots of uses, such as holding a chalk board, canvas, paper and more. Your kids will love it! This free standing three-legged wooden easel that can be built using these simple to follow plans with illustrations and helpful tips. Take a single weekend and build a good looking wooden easel that has several uses, just follow this easy plan.